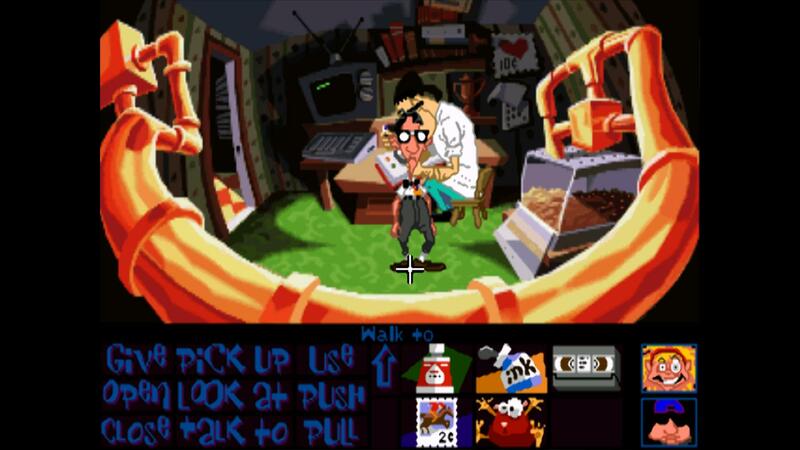 So here's the computer in Ed's room in DOTT. When you use it you play the dos v1 version of maniac mansion as included on the CD. I'm thinking of replacing it with a version more appropriate to the design of the computer.. so what's it supposed to be? Amiga? Apple 2? Atari ST? Commodore 64? I've never seen a PC with tv dialers before. This may be a stupid question to ask. I might pick up the amiga version of MM and replace it though. 8-bit and 16-bit computers were connected to small TVs more often than real computer displays, so having any TV style knobs is not unusual and on the other hand it tells absolutely nothing about the computer itself. Anyway, the computer is obviously a Commodore 64. The shape of that thing as well as the row of four function keys on the right side should be an undeniable sign of its brand.